"The root and origin of all evil arose in that part of England called Northumbria to produce plunder and arson, strife and war". There were three separate raids during January, April and July that year which left the whole area in a constant state of war. It is important to understand the state of England at the time. 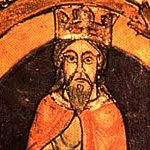 King Stephen had come to the throne three years previously to usurp the anointed successor, Henry's daughter Matilda. Unfortunately for him Matilda was well connected and married to Geoffrey of Anjou, one of the most powerful French magnates. She also had King David of Scotland as her uncle and he had invaded the North in 1136. However, on that occasion he was forced to negotiate and the first treaty of Durham granted Carlisle and Doncaster to the Scottish King. The first invasion in January centred around the siege of Wark and ravaging the area nearly as far south as Durham. He then crossed the border into England again on 8 April and again at the end of July. These campaigns saw an escalation in brutality and the devastation of the North barely some 70 years since William the Conqueror had undertaken the "Harrying of the North". As always it is difficult to separate the truth from the hyperbole. We have testimony from Richard of Hexham; he was the canon of the Abbey at Hexham and later became the prior there. He wrote that the Scots took great sadistic pleasure in their grisly work. Their second and third invasions targeted the areas they had previously missed and there was more than one report of a group of schoolboys having been burnt alive in their school. It is interesting to note that slavery was still practiced on the fringes of Celtic society and whilst the English might take captives for ransom, with the Scots it could be much worse. The tradition of devastating the countryside and forcing your foe to negotiate without actually meeting in battle has come down to us as "Chevauchée" (a medieval French term) and these raids into Northumbria were not the first or indeed the last we would see of this practice.